The Toriko experience has certainly been an interesting one so far. Since FUNimation began releasing the series at the beginning of the year, anime fans have had a chance to experience a shonen series unlike any I’ve personally seen before. One focused almost entirely around food. Now while Part 3 of the release was more combat oriented compared to the first two releases, does Toriko: Part 4 bring monster slaying, ingredient hunting and food back to the forefront while also keeping the show interesting? Let me start this off with a bit of a warning, anyone attempting to jump into the series at this point will not only be completely lost on the storyline of Toriko but also missing out on important plot points. Therefore knowledge of the rest of the Toriko series up to this point is required not only for enjoyment but also understanding the various terms used in the series. 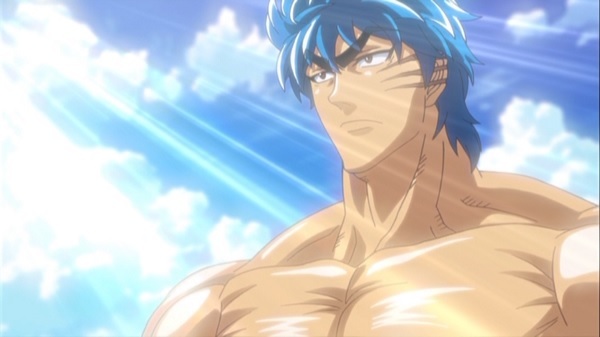 Back when Toriko: Part 3 ended, viewers probably felt shortchanged thanks to the fact that despite focusing entirely on the longest running story arc of the series, the “Century Soup” arc, the release ended one episode away before the end of said arc. Although rather predictable, Toriko: Part 4 kicks things off by bringing the “Century Soup” arc to a close with the first episode before moving on with the story. Unfortunately, it quickly becomes evident that after the long running Century Soup arc, the writers of Toriko decided to take a break because rather than keep things moving at a brisk pace, half of Toriko: Part 4 consists of episodes which simply feel like filler. 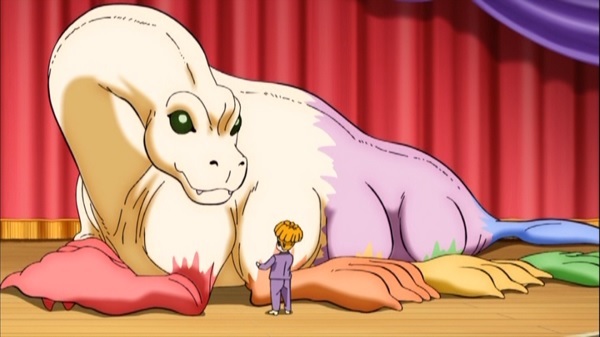 The following mini-arc presented after “Century Soup” is completely inconsequential and only shows off more of the strange creatures in the world of Toriko, nothing more. 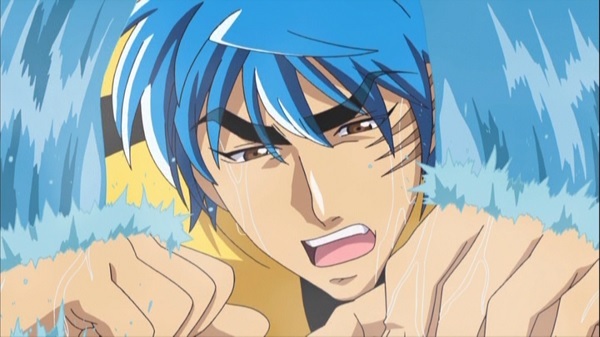 Thankfully, once the series moves past the filler mini-arc, viewers will find that Toriko: Part 4 actually contains not only character development, but new revelations about the world that show that Toriko and the rest of the Heavenly Kings are still nothing more than small fish swimming in a big pond full of predators and mysterious creatures with unfathomable power. While battling against the Gourmet Corps’ forces has always been a challenge for Toriko and the group, rarely has there ever been a time that Toriko was actually pushed to the limit by a monster or even the environment. With the revelations of the Gourmet World and the power wielded by the older generation of Gourmet Hunters, viewers are left knowing that despite his beastly strength, Toriko has quite a ways to go. Now while the Toriko series hasn’t been completely devoid of character development since it began, the only character to really ever be developed, outside of inconsequential powering up, is Komatsu. However Komatu’s development has always been squandered instantly thanks to the fact that no matter what type of successes he had up to this point, he remained the whiny boy who practically “fudges” himself anytime something happens. However Komatsu, and by proxy Toriko thanks to their bonding, receives some actual noteworthy character development in this release. Not only does he grow more confident in his own abilities he also becomes a useful member of the group. Of course whenever he is presented with a dangerous situation he still will react rather characteristically, but even then he no longer believes that everyone is going to instantly be killed. Toriko: Part 4 finally finishes the “Century Soup” arc before languishing in the middle in filler territory before finally sending Toriko and Komatsu off on a character building journey together. Of course things also take an interesting turn when the true terrors of the “Gourmet World” are revealed and even Toriko finds himself at death’s door despite his confidence. 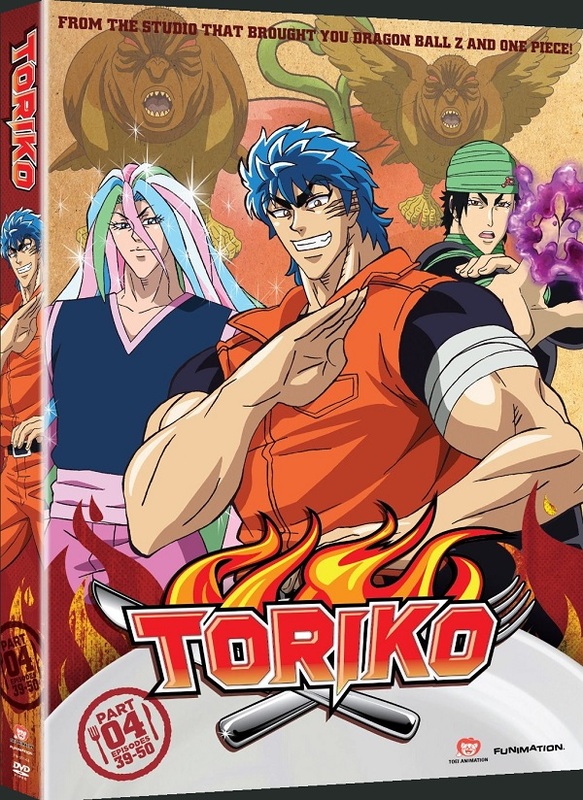 While Toriko’s animation quality and artwork has always been a mixed bag throughout its release history, Toriko: Part 4 falls into the middle of the spectrum of decent and terrible artwork. While viewers are presented with some jaw-dropping scenery and great food-themed areas in Part 4, the character animation itself is quite poor at times, often suffering noticeable drops in quality that remain apparent for minutes at a time. 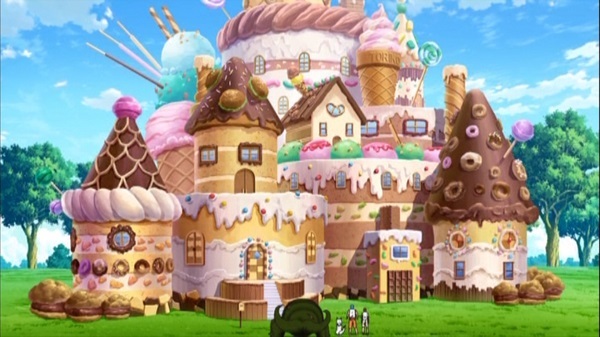 As mentioned before, one of the biggest highlights of Toriko is the exaggerated food and ingredients that the cast hunts down and creates. This offers viewers not only various lush landscapes vibrantly colored with a wide-range of colors, but outlandish animals/monsters as well which helps keep things fresh. The English voice track for Toriko has always been very impressive and it remains true with this release. Toriko’s voice actor Ian Sinclair is priceless as the muscle-bound glutton with his exuberant voice acting perfectly fitting the character. 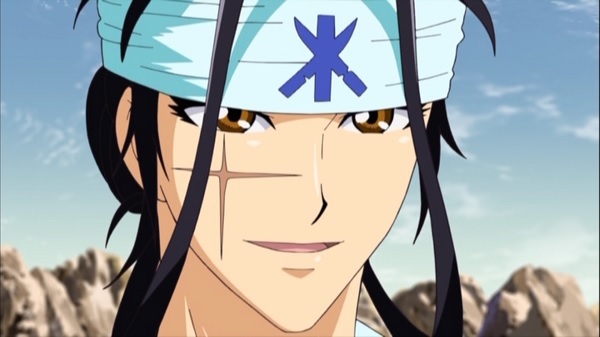 The rest of the cast also offers impressive voice work and again it is worth highlighting that a few of the voices in Toriko are actually quite fresh to the voice acting scene, so this is especially noteworthy. As for the background music, Toriko: Part 4 continues to be very forgettable as far as the series’ soundtrack goes. There is an unknown insert song with vocals in the second episode of this release which was quite refreshing, though this treatment is not given to any other episodes contained in Part: 4. The opening theme continues to be “Gatsu Gatsu” by Akira Kushida which, despite being a bit old now, still is an excellent opening that fits the mood of the series perfectly. As for the ending track, we have a more dramatic song called “Sabrina” by Leo Ieri. At first this ending theme felt out of place, however it quickly turned into my favorite ending theme in the entire series. Toriko: Part 4 comes with a rather interesting set of special features that, while not too far from the norm, are interesting thanks to one inclusion. Before that however we have your standard inclusions such as the clean opening and ending themes, trailers for other FUNimation shows, the US trailer for Toriko, two episode commentaries and an actual video commentary which is quite a delight. The first commentary track is for episode 40 and it features Ian Sinclair, the voice of Toriko, and Jarrod Greene, the voice of Coco. These two spend most of the commentary discussing various “foodie” topics as well as what Jarrod’s favorite meal would be for his birthday. The second track is for episode 46 and for this one, Ian Sinclair returns once again and Josh Grelle, the voice of Komatsu, joins him for the second pairing of this group. Since the two already discussed their favorite foods etc in their first commentary, this one focuses more on the episode itself and how the characters have developed sine the start of the series. Closing out the bonus features we have the “Feast with the cast of Toriko: Episode 42 Video commentary” which features Ian Sinclair the voice of Toriko, Jarrod Greene the voice of Coco, Aaron Roberts who voices Sunny, and Morgan Garrett, the voice of Tina. Each cast member brought a dish that was inspired by food from Toriko, including some very weird combinations and they discuss the episode while pigging out on the food. This is a very nice change of pace and a sign that hopefully more video commentaries like this will be included instead of the simple audio recordings. 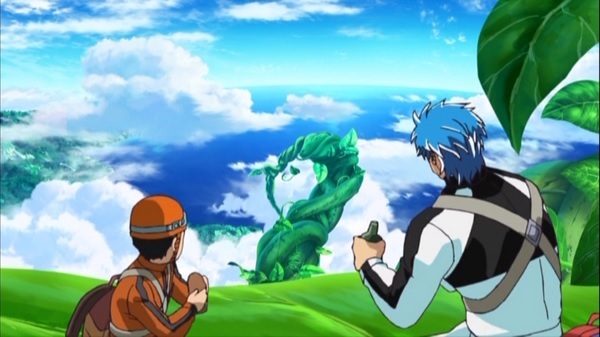 Once more viewers find themselves in the food-rich world of Toriko with a great English cast but sub-par visuals. Toriko: Part 4 expands the world of the series greatly by not only giving viewers their first glimpse of the Gourmet World, but also showing just how far along Toriko actually is when it comes to the true challenges Gourmet Hunters can face. Actual character development somewhat makes up for the poorly-paced story, though given the arc that Part 4 ends with, viewers are left with the reveal of a new character and a new challenge for Komatsu and Toriko that goes past simply defeating an opponent or conquering an ingredient.